From Division 6 in Connecticut on 6-25-11, Abe Kalechman from Stafford Springs Ct is one step closer to the ABA National Championship with a 1st Place win and $388.00 in the American Fishing Tour bass tournament held on Candlewood Lake this past weekend. Abe?s 5 bass limit weighed in at 16.44 lbs. Second place went to E.J. Cusano with a weight of 13.15 lbs, third place was Chris Bielert with a weight of 12.74 lbs. Big bass was awarded to Tom Dupuis for catching a 4.76 pound smallmouth.These anglers are acquiring valuable points to insure their birth in division?s two-day champion and the American Fishing Tour National Championship that will be held this fall. 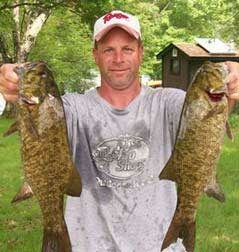 Their points are also being used to determine the divisional angler of the year. The top angler by points earned in this division will represent the division in the Angler of the Year final round. Kevin Rose Jr 11.71 Lbs. Conditions: Overcast, light winds and a threat of rain started out the day with clearing skies later on in the afternoon.Winning Strategy: Because of the weather conditions fish were caught on topwaters in the early morning but plastics ruled the rest of the day.Next Divisional Tournament: This division?s next tournament will be 7-23-11 on Congamong Lake at the Southwick MA launch ramp.For more information on this or any future event in this division contact Tom Dupuis at 860-987-7371 or by email at: bassman11@earthlink.net.The American Fishing Tour offers low cost, close to home bass tournaments that are designed for the weekend angler. All ABA anglers fish for money and points. The points advance the angler to their divisional championship and the top 500 anglers in the US are invited to the American Fishing Tour National Championship.For more tournament news click here.